Read 2 times. Last read September 28, 2013 to October 9, 2013. I first read this book back in '06 and remembered liking it a great deal. Listening to this full cast recording of the author's preferred text, I didn't particularly notice much difference (that being said, I didn't really remember the Hinzelman scene or the coming to America passages from before so who knows). That all said, I really enjoy this book. In his introduction, Gaiman says he was interested in working with the gods of America but it seems to me he's basically using a lot of the research left over from the Sandman and I'm okay with that. I'm also okay with the darkness of this piece. The plot itself follows Shadow, a big man of indeterminate origin, who gets out of prison only to be swept into a battle royal where he has no idea who to trust or why he's involved in the first place. He very quickly ends up working for a man called Wednesday and the adventure begins. The odds, from the time shadow gets out of prison are stacked against him. Working for Wednesday is not a choice so much as an escape from emotional devastation. Of course, as his employment progresses it turns out that Shadow is naturally very good at his blurrily defined job. He knows the right thing to say at the right time and even his mistakes will, by the end, turn into positives he can use to his advantage. Ultimately, Gaiman scores again. He's one of the best writers working today, able to mix genres and cross fantastic themes with the trials and tribulations of every day life. No easy feat and we're the richer for it. 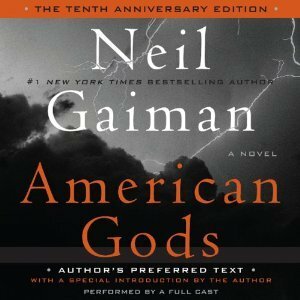 Sign into Goodreads to see if any of your friends have read American Gods.